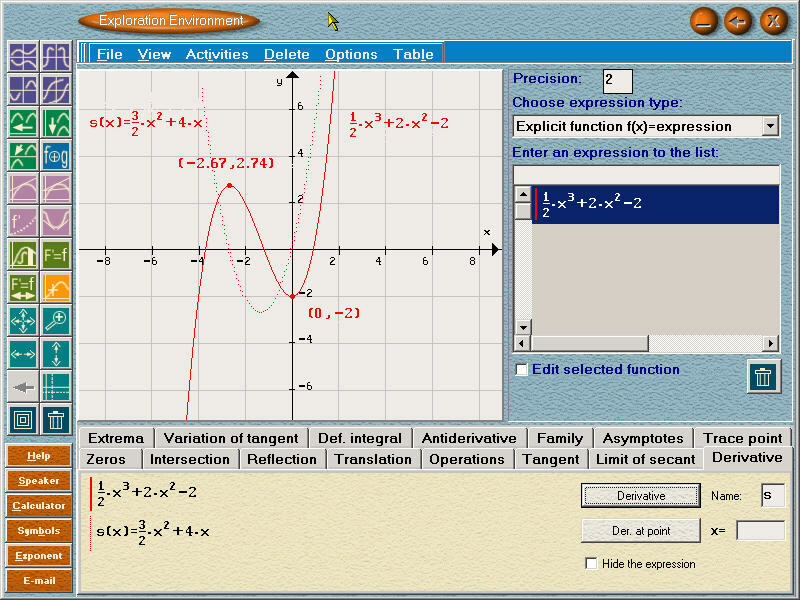 The exploration environment permits the study of mathematical phenomena using open software in which graphs of functions, inequalities and families of curves may be drawn. This environment possesses the characteristics of a sophisticated graphic calculator with additional options of using the mouse to perform operations. The exploration environment may be reached via the main windows of MATH-TEACHER : from the list of subjects, from the list of levels, from an exercise and from any tutorial panel. This permits both independent working in the exploration environment, as well as the option of combining work in the exploration environment with exercises while monitoring the pupil's answers at each of the stages of the solution. The environment may be used to examine the behavior of the explicit functions, linear inequality, family of functions, curves of the second degree and more.